Sometime we like to change printer setting. 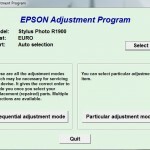 often change of printer setting, possible in a moment we wish to return printer setting become default factory setting. If wishing to change printer setting to default factory setting usually have been provided in the manual book. Sometime in the manual book not be mentioned the way to reset printer setting to the factory default setting, or manual book of losing. To alter setting on HP Color LaserJet 2820 to default factory setting can follow intruction under. HP Color LaserJet 2820 All-In-One integrates a high-speed color printer, scanner and copier into one unit. Turn on the Printer, and then On the device control panel, press Menu. Use the < or the > button to select Service, and then press Enter. Use the < or the > button to select Restore defaults, and then press Enter. After pressed enter button the device automatically restart and Hp Color Laserjet 2820 have been returned to default factory setting. Related to "Restore to Default Factory Setting on HP Color LaserJet 2820 Printer"